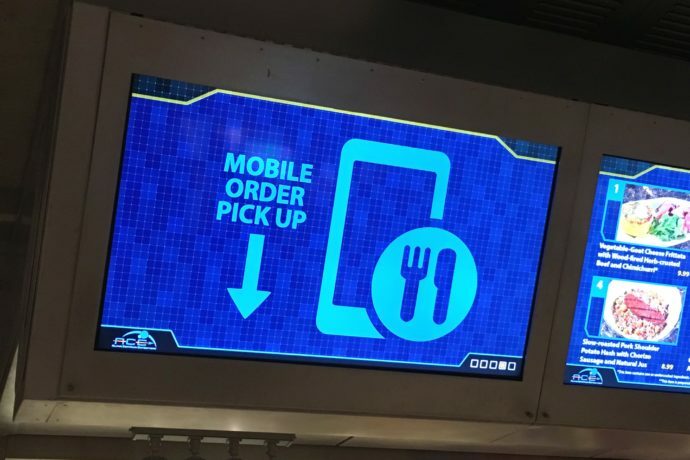 Mobile Order is the new service that allows you to pre-order your food and drinks at select Walt Disney World quick service restaurants using the My Disney Experience app on your mobile device. This means you can skip the line and just pick up your order from the window. The app will even alert you when it’s ready! All of the following locations now offer Mobile Order. We will update this list as more restaurants are added. No matter where you are you can open the My Disney Experience app and either go to My Plans and select “Order Food” or select a specific restaurant and press the “Order Food” button. (See list above for participating locations.) Add items to your cart and follow the simple steps below. It’s as easy as 1, 2, 3! You can look through the entire menu, select the items you want, and tap the +Add button to add it to your cart. Tapping an item from the list will give you a brief description and usually a picture of the food. You can go to your cart to remove items by tapping the icon on the top-right of your screen. You can also change the quantities for each of your items from your cart. Once you’re done adding items to you cart, review your order, and then purchase it from the app. You may use credit cards, debit cards, or Disney dining plans for mobile order payments. For card payments you can use a previously stored card or a new card. Enter the card details manually or use the scan card option to use your device’s camera to gather the card’s details for you. 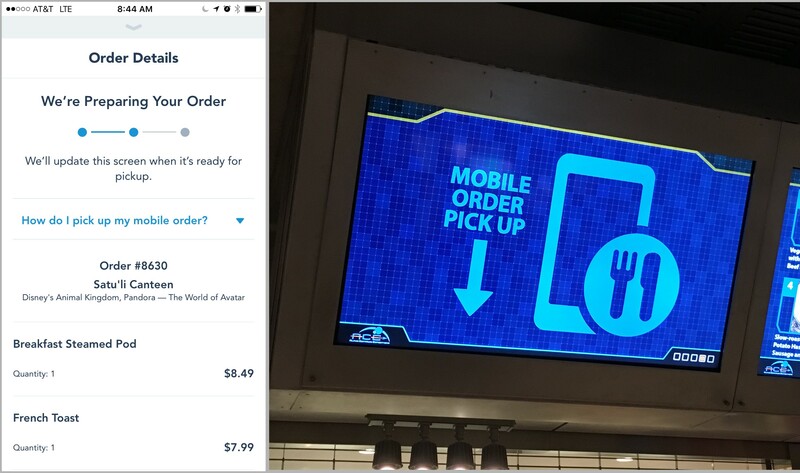 Each quick service location has a specified pick-up window where Mobile Orders can be picked up and it should be labeled with the Mobile Order logo. If you’re not sure where to go, ask a Cast Member. Here are some helpful tips and common questions about the Mobile Order system. If your question isn’t answered here, leave a comment below and we’ll do our best to try and find you an answer. How early can I order my food? Your order can only be placed during regular operating hours for that location. For example, if the restaurant doesn’t open until 11AM, you cannot place your order until 11AM. Can I pay using Disney Dining Plan? Yes! 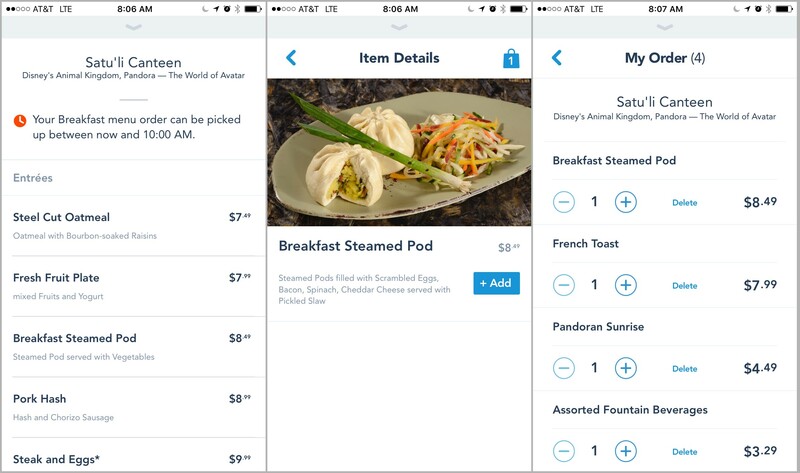 While it was not initially a part of the system, guests may now redeem Disney Dining Plan meal and snack credits in Mobile Order. 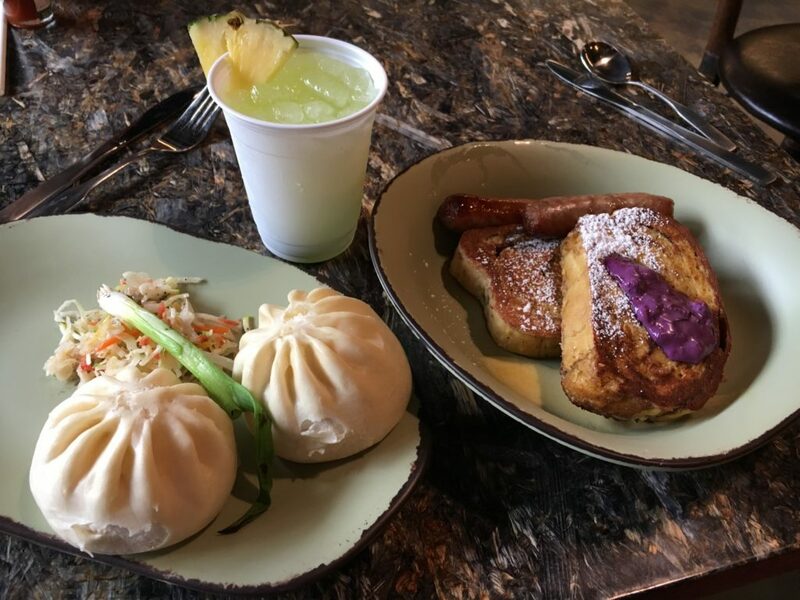 All three Disney dining plans are available with Mobile Order: the Disney Quick-Service Dining Plan, the Disney Dining Plan and the Disney Deluxe Dining Plan. Just make sure to use your same account to order food that is linked to your plan. Can I pay using a Disney Gift Card? Can I receive my guest discount (Annual Pass, DVC, etc)? Can I receive my Cast Member discount? Yes. As of November 2018, Cast Members who have their Main Gate pass connected to the app will be able to receive their Cast Member discount at select quick service locations. CM discount is not available at all locations. Yes, but only if you have not yet selected the “I’m Here” button. 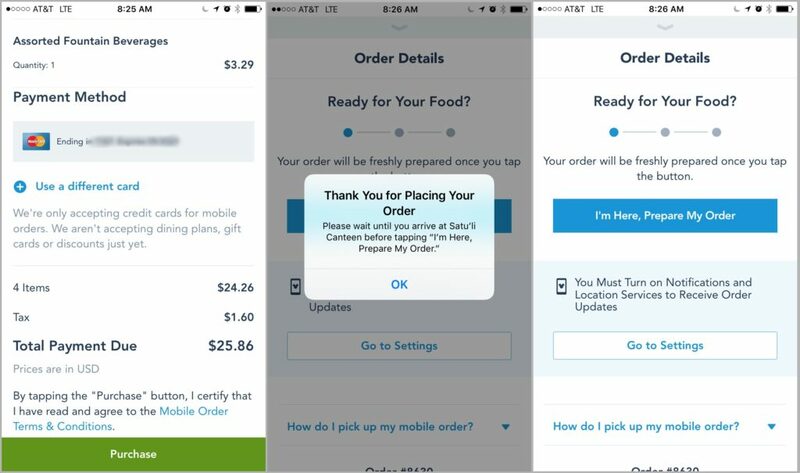 Your payment will not be finalized until you select “I’m Here” and you can cancel your order any time from a link at the bottom of the screen. Orders cannot be modified after they have been submitted but may be cancelled anytime until you select the “I’m Here” button. Will I be charged if I never select “I’m Here” button? No. If you never select the “I’m Here” button your order will be canceled automatically at the end of the day and your payment method will not be charged. Do I have to be on Disney property to place my Mobile Order? No, currently an order can be placed through the app no matter where you are physically. Just keep in mind that you should not select the “I’m Here” option until you are actually at the location. An order cannot be canceled or refunded after you do. Can I add items to my cart now, but then pay later? Do I have to enable Push Notifications to use Mobile Order? 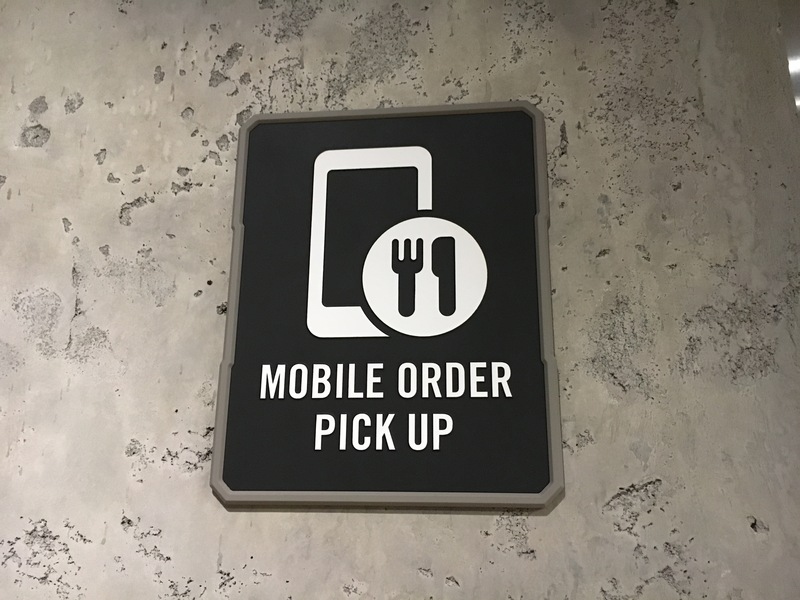 Can special dietary requests be made through Mobile Order? No, special request orders such as gluten free, allergy-free, etc. must be placed in person at the restaurant. Where can I find the complete Terms and Conditions? You can read the full Mobile Order terms of service by clicking here.